I was skeptical. When I saw Kelly LeDonni's table at the CHOP celiac event last month from afar, my first thought was: "Who needs special labels? A pack of colored stickers and a Sharpie will do." 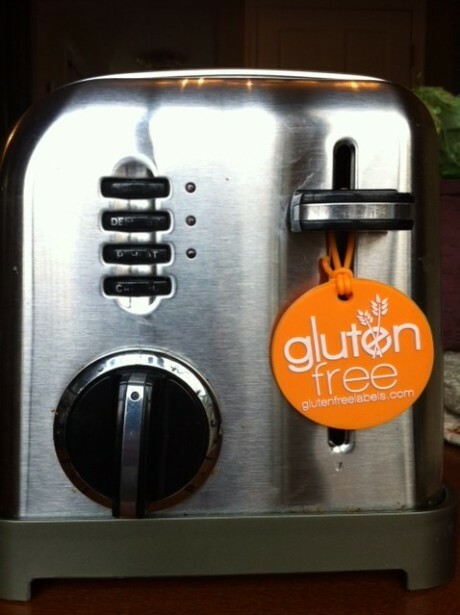 Indeed, Kelly got her idea for her Doylestown-based company, Gluten Free Labels, from labeling gluten-free items in her home with a permanent marker. I came around, though, when I saw the bright orange tags she created that can be attached to strainers, cutting boards, pots and pans to signify their dedicated gluten-free use. 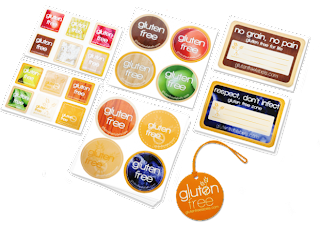 Because they're made of silicone, the 2" round "Gluten Free" tags, which can be tied to cookware and utensil handles, are dishwasher-, microwaveable- and oven-safe. Kelly has taken on the humble sticker as well. Her colorful circle and mini square versions are pre-printed with the words "Gluten Free" and are sturdier than the round button-size stickers we've used before, which tend to fall off before too long. The larger rectangular labels - with cute phrases like "Respect, Don't Infect" and "No Grain, No Pain" - have space for writing. You can let your "free-k" flag fly with Kelly's newest product - toothpick flags that are perfect for distinguishing safe appetizers, cupcakes and finger foods from their glutenous cousins. Kelly is shipping her products free for a limited time, and a portion of the proceeds benefit the National Foundation for Celiac Awareness. A two-piece tag bundle is $4.99 and a $14.99 starter kit includes eight circle labels, 12 mini labels, two rectangular labels and one tag. A set of 32 toothpick flags are $4.99. There's also an "ultimate" kit for $21.99. Orders can be placed through the company's online shop. Disclosure: Gluten Free Philly receives a commission from purchases made through the links in this post via a third-party affiliate network. However, neither Gluten Free Labels nor the affiliate network sponsored this post.